Quiz: Which Apex Legends character are you? There are eight to choose from, which one is really the right one for you? 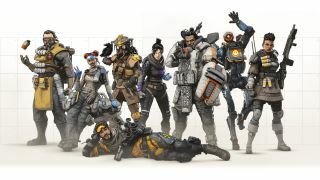 There are eight characters - or actually Legends - to unlock in Respawn's brand new battle royale title, Apex Legends. Ranging from an interdimensional warper and a combat medic, to a human tank or a master of toxic gas, it can be tricky to figure out exactly which one is best for your playstyle. But don't fret, we've not only got a breakdown of the best Apex Legends characters, we've also got a handy quiz that should narrow down who's your brand new Legend-ary pal. Apex Legends arrived as a surprise launch by EA studio Respawn, and you can download it now for free. Yes, free. Taking on elements of several other titles, including Fortnite, PUBG, and even Overwatch, this brand new entry into the battle royale genre is doing things a bit differently, by ensuring players enter as teams of three, with 20 teams competing to be the champions of the match. The current winners are announced live in-game courtesy of some Hunger Games-style banners, and players don't even have to communicate using their real-world voices thanks to the ingenious designed 'ping' system that allows them to point out enemies, loot and other key items just by pressing a button.